Since its inception, Android has matured rapidly as a gaming platform. Google’s first attempt at a mobile operating system has handsomely rewarded those who had the patience – and drive! -- to overcome its early shortcomings. The story begins in October 2003, when Android, Inc. was founded in Palo Alto, CA by Andy Rubin and his team. Later, in 2005, Google acquired Android Inc., and by 2007, the Open Handset Alliance had been formed and the Android Beta SDK released. It’s unknown exactly when the first Android games entered development, but in August 2008, Google announced that the Android Market would open to the public that October. October 2008 also marks the release of the first Android phone, the G1, on T-Mobile’s GSM network. About a week later, the G1 (also known as the HTC Dream) showed up in the UK, but it wouldn’t be until early 2009 that other carriers would receive the device. T-Mobile customers that ponied up $129 with new two year contract (or $399 without contract) could start downloading free games from the Android Market on launch day. The Android Market initially only supported free apps, and paid app support arrived later in February of 2009. The G1’s hardware specs such as its VGA screen (320 x 480), 528 MHz ARM11 CPU, Adreno 130 GPU (an anagram of ATI’s Radeon brand), 192 MB of RAM, and 256 MB of internal storage enabled gamers to enjoy some early, classic titles. The iPhone 3G was the G1’s main competitor at the time. In terms of hardware, the iPhone 3G had a similar VGA screen, 128MB of RAM, Power VR MBX Lite GPU, slightly slower 412MHz ARM CPU, but much larger 8GB of internal storage. However, this extra bit of hardware, along with a more refined app ecosystem and user experience, came at a higher $199 price. It’s also worth noting that the iOS platform was publicly available nearly 2 years before Android, which enabled Apple to put millions of devices in consumers’ hands prior the G1’s arrival. Getting to market sooner gave iOS an early lead in mobile gaming. However, as the years passed, this gap would eventually close. Mobile enthusiasts may be quick to point out that BlackBerry was in existence long before Android and iOS; shouldn’t it have had an advantage over both of its competitors? However, due to its focus on business applications and late adoption of touch screens, it was quickly left behind. During the early days of the G1, developers had to be very conscious of the memory footprint of their games. The CPU and GPU were relatively weak (by today’s standards), and its 256MB of internal storage was quickly filled by the operating system itself, leaving little room for entertainment. Android also had a little known restriction that came into play during app installation. It would not permit the user to install an app unless the user had at least 4 times the amount of disk space needed. For example, an app with a package size of 4MB could only be installed on a device that had at least 32MB of free space. Despite these challenges, the first round of games available on the Android Market was good enough to light the spark. Initial Android games included the likes of Pac-Man by Namco, Solitaire, Texas Hold ‘Em, Snake, Chess, and Bonsai Blast by Glu Mobile. Within 4 months of release, Namco’s Pac-Man had racked up more than 250,000 downloads. Other popular game titles were slightly behind at 50,000 to 250,000 downloads a piece. By comparison, the Apple App Store opened around the same time (July 2008) and within a month users had downloaded more than 60 million apps total. During this same short timeframe, Sega surpassed Namco’s Pac-Man sales numbers by selling more than 300,000 copies of its 3D Super Monkey Ball (at $9.99 each). While iOS was showing off fancy 3D titles, Android gamers had to settle for 2D games, and network-based multiplayer hadn’t yet made its way onto the scene. Even with simpler 2D graphics, the G1 would sometimes struggle while rendering frames in some of the more visually intense titles such as Bonsai Blast. Developers were still new to the platform, and the hardware had a long way to go. However, the G1 provided the first step toward what would eventually become a notable gaming platform. Throughout 2009, new Android devices and OS versions were released in ever faster succession across a wide variety of carriers, with each device improving on its predecessor’s hardware specs, software efficiency, and user experience. The proliferation of new devices brought with it a host of new games, some of which included significant improvements such as parallax scrolling, 3D graphics, and network-enabled multiplayer. That year the state of Android gaming was also propelled forward by Google’s Android Developer 2 competition which yielded some landmark games. For example, Speed Forge 3D by RatSquare took home first prize in the arcade/action category, and developer Che’s multiplayer What the Doodle?! was at the top of the casual/puzzle category. Other notable 2D finishers included Hexage’s Totemo and Moto X Mayhem by Occamy Games. 2009 also marks the beginning of Android’s fragmentation problem. By the end of the year, at any single point in time, Android devices could be found with different hardware, different carriers, different Android versions, and different screen sizes and aspect ratios. These new features enabled developers (and gamers) to push the envelope, but it came at a price. In some cases, games that looked great on VGA screens now had black bars, as developers struggled to effectively use the additional screen real estate on new devices. In other cases, developers were forced to choose between creating a game with high-end graphics for only a select few and creating a lower end title that would work on a wider variety of devices. Fragmentation has only gotten worse with time, but luckily developers have learned how to manage it by employing better practices, tools, and techniques. For example, when creating a new Android game, developers now take the wide variety of devices into consideration and plan ahead for tackling the associated issues. Partially as a result, the use of OpenGL has become increasingly common as it offers many clean ways to appropriately display content regardless of a screen’s aspect ratio, physical size, or pixel density. Cross-platform tools such as LibGDX and Unity3D have done a good job helping developers overcome these hurdles. While Android game developers were busy learning how to overcome fragmentation, developers working on iOS titles did not have to address these considerations. Due to Apple’s tightly controlled approach, iOS games could be developed for a single aspect ratio with nicely scaled pixel densities (at least until the release of the iPhone 5). The added simplicity of developing games for a single 3:2 aspect ratio helped iOS game developers offset some of the hurdles required by Apple’s cumbersome App Store approval process. 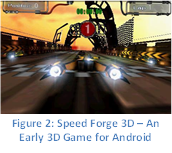 Starting in 2010, mobile social gaming platforms such as OpenFeint, Scoreloop, and Papaya Mobile emerged to offer Android developers with easy solutions for adding features such as global leaderboards, achievements, and player management. These companies gave developers the opportunity to implement social features without requiring them to manage the infrastructure. Due to their incredibly convenient offerings, developers quickly adopted the platforms. Since 2010, both OpenFeint and Scoreloop have been acquired. OpenFeint was purchased by GREE for $104 million and Scoreloop was purchased by Research In Motion (RIM) for an undisclosed sum. Ease of integration and intrusiveness of these social gaming platforms has often been a point of contention between players and developers. Therefore, Swarm, a new alternative, was created in 2011. With Swarm, mobile game developers can add social gaming features with only a few lines of code, and they can choose when and where to use each feature. Full APIs are also available to enable developers to create experiences that match the look and feel of their own games. Throughout 2011, Android improved by leaps and bounds and its market share increased exponentially. Companies with well-known brand names such as Electronic Arts and Disney have joined the fray alongside mobile specialists Gameloft and Rovio in hopes of capturing their share of the pie. The quality of games has come a long ways since the G1 first entered the scene. 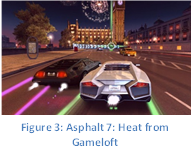 Thanks to powerful hardware on devices such as the Nexus 7 tablet, today Android gamers can enjoy solid 3D titles such as Madfinger Games’ Dead Trigger, Gameloft’s Asphalt 7: Heat, and EA’s Mass Effect. MMOs are also becoming increasingly popular thanks to the growing availability of 4G connectivity. The pick-up-and-play nature of mobile devices enables players to work on leveling up their characters whether they’re at home or on the go. Pocket Legends by Spacetime Studios has enjoyed millions of downloads and so has Com2uS’s The World of Magic. Mobile devices are rapidly coming up to par with dedicated gaming systems such as the Nintendo 3DS and PlayStation Vita, and it seems that they will continue to disrupt the handheld gaming market before finally taking it over almost entirely. Handhelds have yet to show the market that they can match the convenience and connectivity of mobile device gaming. What’s in store for the future of Android gaming? Android will likely continue to find its way into an ever increasing variety of devices. Perhaps one of the most notable devices released to date has been Sony’s game-centric Xperia Play, but this is only the beginning. Recently, a company named Boxer8 raised more than $8 million dollars on Kickstarter to help launch the Ouya, an Android-based video game console willing to take on the Big Three in the living room. Branching outside of video games, Android is being used as a platform to control physical devices such as the Sphero the robot gaming system, and Parrot’s AR Drone quadcopters. Furthermore, Google has already announced that Google’s Project Glass will become available in 2013 which will undoubtedly become a platform for innovative game design. It’s an incredibly exciting time to be part of mobile gaming, and we at Swarm can’t wait to see what’s around the corner! Matt has been creating mobile games and apps for ChickenBrick Studios since early 2008. He is also the co-founder of Swarm, LLC, the company behind the Swarm social gaming platform for mobile. When not developing software or working on his company, Matt is helping the Boulder, Colorado tech community by volunteering his time to a local Android Meetup group.